If you want a very special gift for a child or grandchild this is the place and the person who can do that for you. She is talented, good natured, imaginative, and devoted to doing a wonderful job on your project. I cannot speak highly enough about Lara and her work. I have ordered three treasure chests so far and hope the grandchildren just keep coming so I can order more. Another idea would be to make one for yourself to store all the wonderful souvenirs, tickets, menus etc. from a special trip. I know she will make the best souvenir you can buy with pictures of the holiday location so inside is all the stuff collected there and outside fabulous original pictures of that place. I think I will do that for myself. 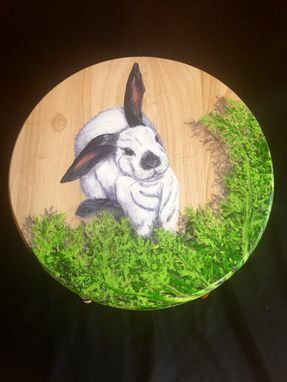 Introducing the Crazy Leg Bunny Stool! This newest addition to my collection of handpainted furniture has quickly become my favorite--what's not to love? 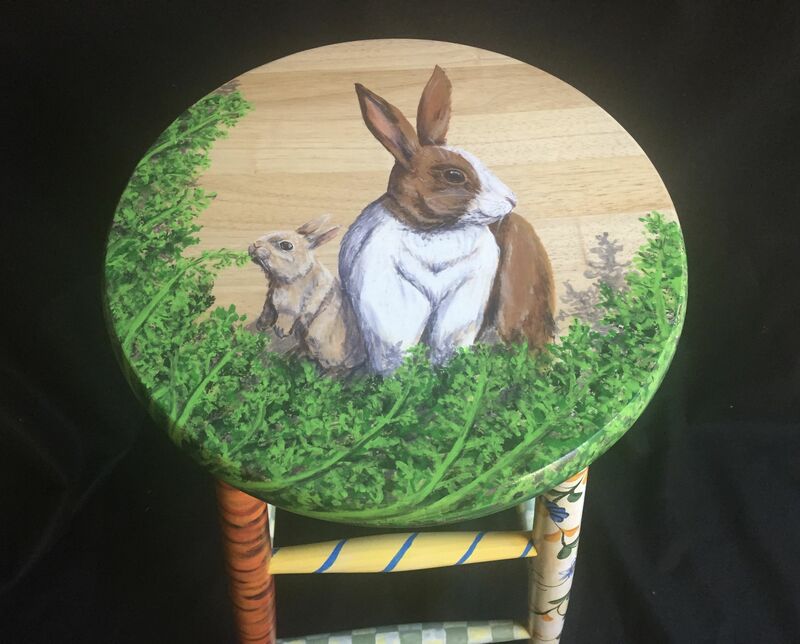 An exuberant cacophony of patterns and colors, a giant carrot for a leg, whose leafy top spills onto the stool seat to frame an adorably fluffy bunny (or two) that you will instantly want to cuddle! 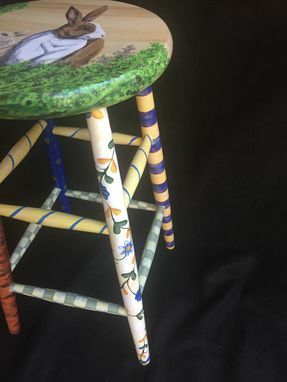 The two pictured were designed and handpainted as a set for a client (price is for individual stool), with colors and patterns customized to her home. 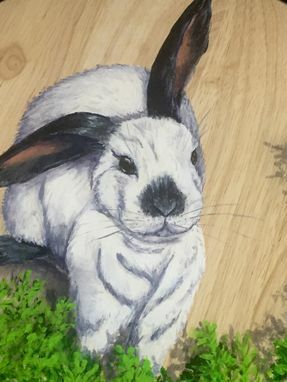 The rabbits pictured were breeds previously owned by the client--the sweet-faced Californian rabbit (smoky black and white) was her beloved Napoleon Bunnyparte! You'll see that I featured her main colors of blue and yellow--swirled, polka dotted, and faux-marbled; you'll see a floral pattern in which I directly referenced her Italian-ceramic-topped kitchen table; and complementary colors of mocha, purple, and sage green to provide checkered and stripy contrast. More is definitely more with this joyous design! All of which means, of course, that it is entirely customizable to YOUR home! Colors, patterns, breed of bunny...let's start a conversation, and together we'll make you a showstopper of a stool! * Pictured stool is 30" tall, other sizes available, just ask! * Handpainted using non-toxic acrylic and latex paints, and non-toxic sealer. Each piece is painted to order, and is signed and numbered for authenticity. Please allow 10-12 weeks for completion. 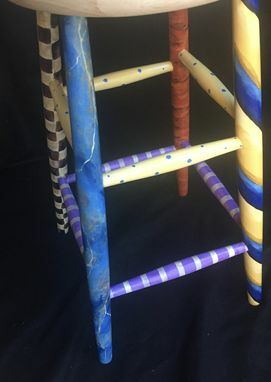 If you'd like to see more pictures of these stools, just ask! Every maker has a story. Be a part of Lara Eve Designs's story by placing an order, leaving a review, and seeing your review appear here.